ANSUL products protect more food service kitchens from fire than any other brand. The R-102 Fire Suppression System incorporates a flexible design with an extremely effective ANSULEX Low pH Liquid Agent. ANSULEX quickly knocks down flames and cools hot surfaces, while generating a tough vapor securing blanket that helps prevent re-flash. The R-102 system is designed to protect areas associated with ventilating equipment, including hoods, ducts, plenums, and filters. It also protects auxiliary grease extraction equipment and cooking equipment such as various types of fryers, griddles, range tops, broilers, char-broilers and woks. The system is ideally suited for commercial kitchens in fast food chains, retail food courts, diners, convenience stores, catering facilities, mobile food trucks, hotels and casinos, stadiums, schools, hospitals and more. The R-102 system is cooking equipment friendly and offered in two designs: Appliance-Specific and Overlapping. The appliance-specific design aims the nozzles at the specific hazard areas of each appliance. With the overlapping design, the nozzles are arranged to overlap and provide a “fire-free zone” throughout a group of appliances. 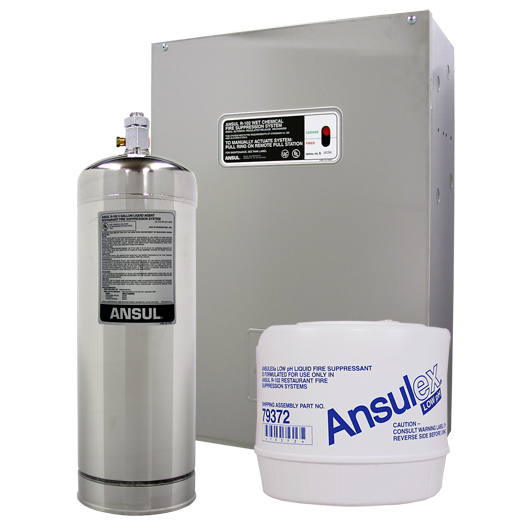 For more information regarding Ansul restruant fire suppression systems please don’t hesitate to contact us.